It appears as if the north and south poles on Jupiter's giant moon are no longer located where they originated. Scientists have been studying images returned by the Galileo spacecraft for almost ten years now. The images transmitted from Jupiter's moons, in particular, revealed structures that seem to defy conventional geological theories. Why is Callisto covered with craters? Why does Ganymede possess a magnetic field? Why does Europa appear to be covered with water ice that is floating on a vast ocean? A May 15, 2008 article in the science journal Nature announced that Europa seems to have experienced displacement of its north and south poles on more than one occasion. Some close-up observations of its surface reveal giant circular and arcuate formations that researchers interpret as coming from faults in the crust. As prevailing opinions suggest, Europa's surface is a multi-kilometer deep shell of water ice floating on a salty sea. The "decoupled" surface undergoes periodic deformation because movement of the ice creates stress cracks, allowing gigantic rafts to form. The ice rafts supposedly move freely around the moon, pulling apart from one another and then crashing into each other as they are disturbed by heat coming from the interior. In general, Europa is thought to have a hot core because the gravitational forces from Jupiter are said to be stretching and squeezing the moon, creating enough friction to melt the subsurface ice. Crustal displacement due to convection in the liquid layer is responsible for the development of "strike slip faults" that do not conform to the predictive models, according to Alyssa R. Sarid, a graduate student at the University of Arizona, and her advisor Richard Greenberg. "With its thin ice shell over a global ocean, Europa is unique. The strike-slip motion provided the key to what has been going on," Sarid reported. Greenberg agrees: "What this suggests is that nothing keeps the thin ice shell of ice covering Europa from sliding around -- it is free to slip and slide over the underlying ocean. 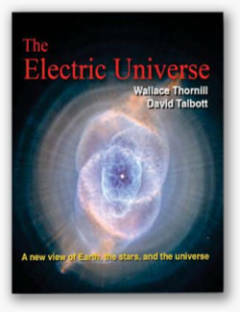 The result is the first confirmation that the crust does wander relative to the poles of rotation." In 1989, a theory was published about the potential for Europa's poles to wander over the surface. "Tidal friction" was tapped as the perpetrator – interior heat makes the ice at the equator thinner than at the poles. Europa's rotational momentum pushes thicker polar ice toward the equator carrying the geographic poles with it. Sarid and Greenberg's research concludes that the ice laid down millions of years ago at the poles is now oriented 30 degrees closer to the equator. The implication is that the processes taking place on Europa are invisible to direct observation since they require immense periods of time for their actions to produce significant effects. What kind of experimental project could confirm this hypothesis? Cracks more than a kilometer deep stretch across the moon from horizon to horizon. Dual ridges bracket flat-bottomed faults and wide, dark bands trace out swaths of contrasting material over two thousand kilometers long. The proposition is that Europa is much like the Arctic Ocean here on Earth and the features we see here can be translated to those we see there. Continental drift and plate tectonics assumptions are used both to explain what has been discovered on Europa and to use Europa as confirmation of the theory, a technique known as "bootstrapping". 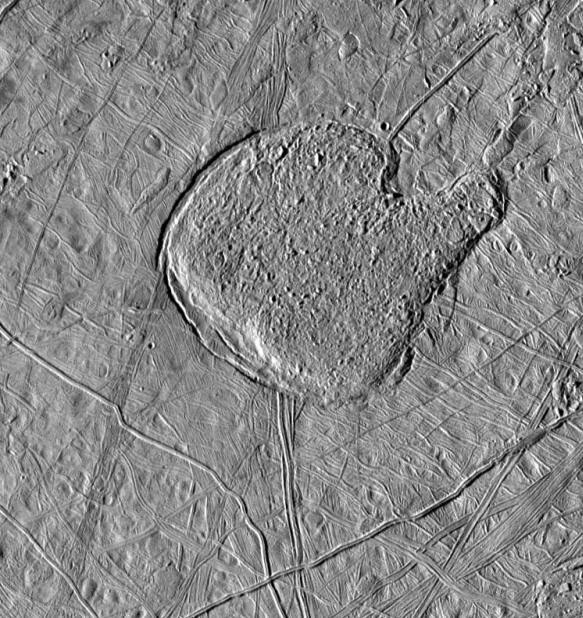 However, as previous Picture of the Day articles have demonstrated, Europa could have reached its present shape in a short period of time and in the relatively recent past. 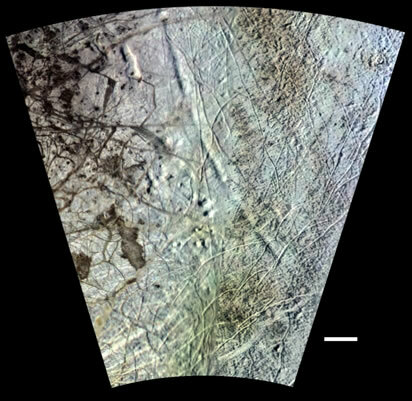 The looping rilles on Europa have no analog to ice cracks on Earth. When ice breaks it is chaotic and affected by variations in thickness and composition so repetitive patterns over long distances should not be expected. Yet, repetitive patterns are observed on Europa, especially in the cycloidal rilles called "flexi". The swirls and loops that cover the moon might lend themselves to duplication in the laboratory using plasma discharge equipment, although at present there are no known experiments of that nature scheduled. It seems evident, though, that whatever happened on Europa in the past is not happening today (thus the long time scales required by standard theories). Greenberg's team from the University of Arizona is building an edifice on top of unstable foundations. Ice is far more homogeneous than rock, so surface discharges on Europa might have excavated the straight trenches. If electric arcs were released in the presence of a magnetic field parallel to the surface, circles or partial circles might be cut into the lithosphere. Claiming that rotation, gravity and melting ice are what shaped Europa and are slowly continuing to do so beyond the limits of our perception means that important factors are being ignored by scientists analyzing observational data. 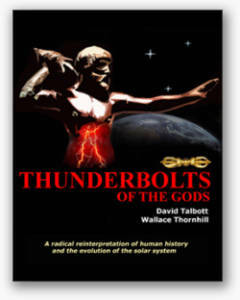 As long ago as 2005, the Thunderbolts team commented on the ironic nature of NASA investigations – but they seem to be continuing in the same vein today. "What is needed in the case of Europa’s surface mysteries is not an arbitrary computer-generated 'solution', but practical experiments to test a new hypothesis. 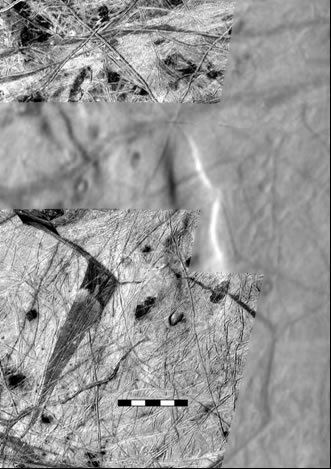 Can electrical discharges produce the rille patterns seen on Europa? 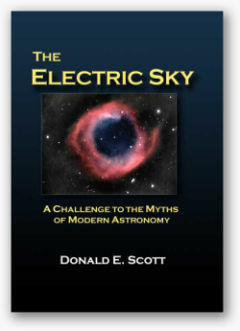 The required experimental work is easily within reach if NASA’s investigators will follow evidence already in hand. The resulting insights could change the direction of planetary science."